What day is it? I seem to ask that a lot. So, we are nearing the end of our sea trials and boy what a trial. I will say Roger is driving the rig like a pro. We took a "short cut" from Summerville, S.C. to RT.95 , (seemed longer) and it turned into a small road with a long drop close to the edge and workmen. I had my walkie talkie in hand ready to call and say move in but he did great. The workers cones were there and not one was maimed or damaged. Their hair blew as he passed but no damage. Monday was our travel day. After stowing everything we started out to Loris and the Cummins dealer to have the pump for our coolant replaced. When the guy patched it last week he told us we could drive for miles it was so sound but his was one time I was happy I was driving behind the coach. Turning onto the highway my windshield was covered with "water" that was coming from the right rear side of CiCi Blue. It wasn't raining so I knew it was the patched pump. As soon as we got onto the highway Roger pulled over and shut off the coach. Steam was pouring from it at that point. There is a law in Florida that if you see someone broke down and on the side of the road you get into the middle lane away from them til you pass. I experienced the result of people not doing that in S.C. I could see the coach rocking and I could feel the Jeep moving as we waited two hours for our repair man to find us. To the cement mixer that flew by us at 70 MPH....really???? Yes, that scared me. We finally got to the Cummins dealership and they had a room and invited all of us in for the duration. The kids laid down and slept and we read magazines and said we would forgo traveling to Georgia and go back to Myrtle Beach for the night. I have seen motor homes on the side of the road or limping down the highway and have thought.."oh wow, glad that's not us but someday it might be. The poor people." Well, we got over that adventure early on didn't we. I could see people passing in their motor homes looking over and just knew what they were thinking. Tuesday morning we started out yet one more time. Roger wanted to drive to a Pilot station for diesel so off we went north west from Georgia. We get a discount so it was worth it to find it. Then on to RT.95 then south to Brunswick where we are now til tomorrow. 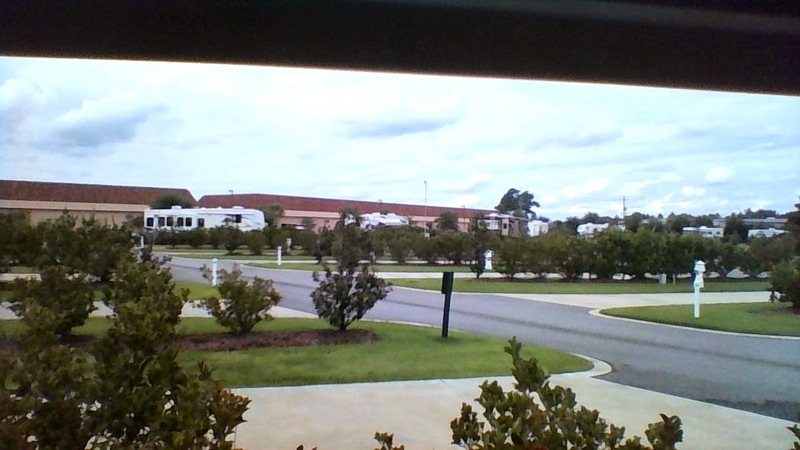 We are at Coastal Georgia RV Resort . The one I first thought was like the Stepford wives...but I have changed my mind after being in dirt or in sand for three weeks. lol. The cement pads are small but the area is grassy and very clean. 50 amp service, electric,water and sewer included in the price. I believe it's $55.00 a night and dogs are welcome. A small dog park, a laundry facility, where my clothes are now, pool and small store. 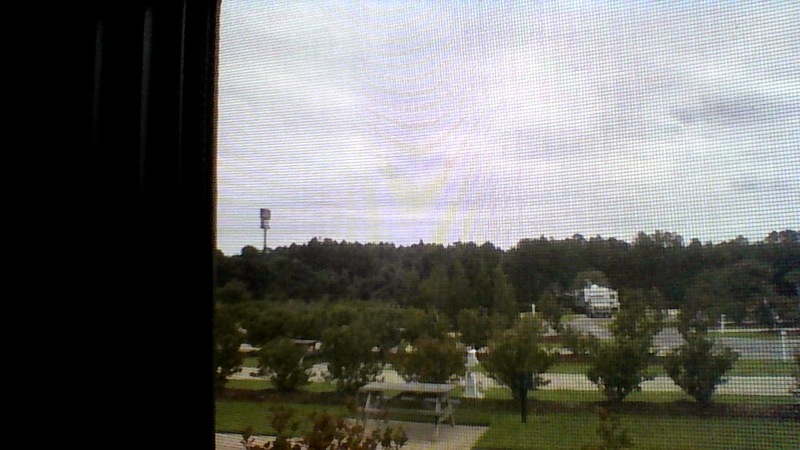 Outside to my left. Pretty empty right now but you get a peek at how it's set up. Out the front door. There's a lake down there somewhere. I'm sure though if it were crowded here it wouldn't be as nice. I love my space. The dogs...I am so proud of them. From the first trip til now they have grown and have become used to the routine. Sammy, who was always hyper now walks along pretty well. Lola, is Lola but does really well too. She barks to let us know she needs to go out and Ozzie walks to the front door and stares. Mostly they sleep. We have walked more than I have in years and it's been fantastic. (Looking forward to massages.) I ride my bike when ever I can and love it. We have met great people who share our life on the road and we are looking forward to meeting more. Tomorrow we are back to our home base for a bit. The repairs weren't in the budget quite yet so we will stay and regroup and plot and plan our next adventure. Have a great day and see you in Florida tomorrow. Only 3 hours to Crystal Lake RV Park so it won't be so exhausting. (So tired of autocorrect is why first comment was deleted.). Yay..looking forward to your return.